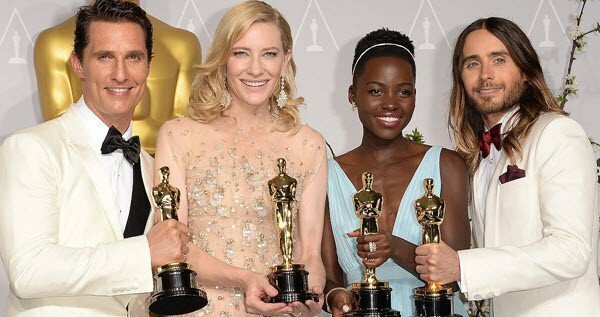 This year’s Oscars ceremony turned out to be more about a picture taken on a phone than about the actual winners. Saying that, there was sufficient discussion about a few of the winners to ensure that, if you hadn’t heard the films 12 Years a Slave and Gravity before the event, then you certainly would have afterwards. As many people predicted 12 Years a Slave, directed by Steve McQueen, won the Best Picture accolade. It was the first major award win for McQueen whose previous feature length films, Hunger and Shame, had received a large number of smaller award wins and nominations. The film, about a free black man in pre-Civil War New York state who is abducted and sold into slavery, also won awards for Best Supporting Actress and Best Adapted Screenplay. This film, staring Sandra Bullock and George Clooney, was another big winner with a total of seven wins including Best Cinematography, Best Original Musical Score and Best Director. Alfonso Cuarón, who directed this movie about two people stranded in space, was the first Mexican-born director to win an Oscar for Best Director and had previously directed British films Children of Men and Harry Potter and the Prisoner of Azkaban. Another feature of the evening which inspired a great deal of debate, was the ceremony’s hostess, Ellen DeGeneres. Having previously hosted the event in 2007, she was considered a ‘safe option’ by some after Seth MacFarlane’s jokes from the previous year were considered to be too controversial by many but there has been disagreement about how successful her performance was. A number of reporters of the Oscars seemed relieved that her jokes – such as, “Welcome to the Oscars. For those of you watching around the world, it has been a tough couple of days for us here. It has been raining. We’re fine. Thank you for your prayers” – were not as shocking as MacFarlane’s but others criticised her for being boring and the ceremony itself for being too long winded. It turned out though, that the show was ultimately to be stolen by a camera phone. 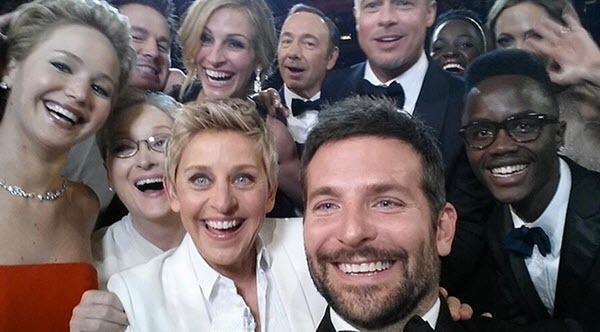 DeGeneres’ selfie of a large group of gathered movie stars, including Brad Pitt, Angelina Jolie, Julia Roberts, Jared Leto and Kevin Spacey, became the most re-tweeted message ever when it was re-tweeted over 2 million times, causing the Twitter site to collapse for a short space of time. The legacy of the 86th Academy Awards show is likely to be that film fans will be unable to decide who was the real hero of the evening: Steve McQueen, Alfonso Cuarón or Ellen DeGeneres’ phone?